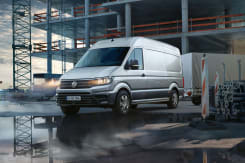 The Crafter is the largest of the Volkswagen commercial vehicles and its robust design makes it perfect for working purposes. 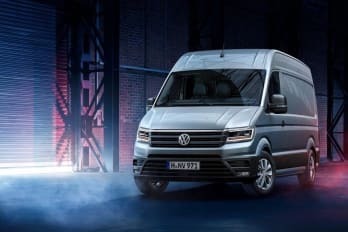 This is the first update of the model since 2006, the van has been updated with a stylish interior, a range of new safety features and is particularly focused on the comfort of the interior in comparison to the 2006 model. There are several engine and drivetrain choices available in the new Crafter. The brand new 2.0-litre TDI engine, developed just for Crafter, is available with four power outputs: 102 PS, 122 PS and 140 PS, plus a bi-turbo TDI with 177 PS. The choice of engines depends on which drive system is selected. There is a choice between front, rear and all-wheel drive (4MOTION), as well as automatic or manual, offering complete flexibility. The new Crafter features a range of new engines that combine high levels of power and torque with low fuel consumption and CO2 figures. Even in the most demanding of conditions, they offer reliability and low running costs. The standard safety kit on all models will include four airbags, Automatic Post-Collision Breaking System, ESP stability and side wind assist. Options on the new Crafter are Adaptive Cruise Control, Lane Assist and Front-Assist emergency braking. 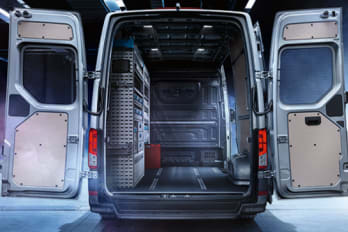 The new practical design utilises space to the best of its ability, with up to three different vehicle heights and lengths available allows you to cater the Crafter for your specific needs. The structure of the New Crafter makes it extremely manoeuvrable yet solid. Crafter CR30 Panel van Startline MWB 102 PS 2.0 TDI 6-speed Manual FWD. †No ownership option. Plus VAT and with a customer initial rental. Business users only.Contract Hire agreement. Fair wear and tear charges may apply. All Prices exclude VAT. VAT payable at the prevailing rate. 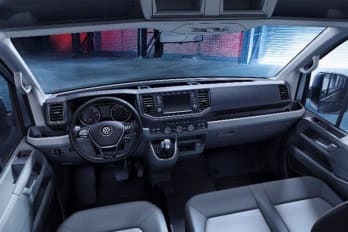 ††At the end of the agreement ownership remains with Volkswagen Commercial Vehicle Financial Services, but provided all terms have been complied with, there are two options: i) commence a Secondary Hiring Period; or ii) customer sells the vehicle as Volkswagen Commercial Vehicle Financial Services' agent. Plus VAT. Business users only. Finance Lease agreement. Business users only. All Prices exclude VAT. VAT payable at the prevailing rate. The condition of the vehicle will affect the resale value and your sales proceeds. Subject to availability and status. 18s+. T&Cs apply. Offer available for vehicles ordered by 30/06/2019 from participating Van Centres. Indemnities may be required. Offers are not available in conjunction with any other offer and may be varied or withdrawn at any time. Accurate at time of publication 04/19. Freepost Volkswagen Commercial Vehicle Financial Services.